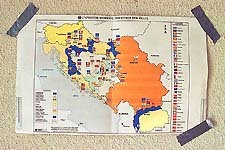 In 1991 I heard about an independence movement in a country called Yugoslavia. I didn't know much about it. It was a place known for the Olympics, and the assassination of a prince there had started World War I. It was interesting that Yugoslavia was one of the last countries left over from the cold war that had not gone through a major political change. I thought the rhetoric coming out of there had an evil nationalistic tone. The fall of the Berlin wall and subsequent collapse of the Soviet Union had led people to believe that the world had taken a turn towards peace. All that wound up happening in places such as Yugoslavia was the lifting of a lid on fervent nationalistic feelings. I decided to go. My decision was reaffirmed by the quick announcement of the independence of Slovenia, one of the republics. I left that night. By the next day it was evident that independence wasn't going to be easy. The Yugoslav Federal Army, with bases in Slovenia, was going to fight the decision to break up Yugoslavia. I arrived in Zagreb, capital of the Croatian Republic. The only way to get to the fighting was by train. The train was filled with anxious and nervous people. I was one of them. I struck up a conversation with a woman sitting in the same car. She was nearly in tears. I said I was a journalist and was going to photograph the independence movement. She looked up at me and said, "This is just the beginning, first Slovenia, then Croatia and Bosnia. Yugoslavia is finished." I replied that she shouldn't worry; there won't be a war in the middle of Europe. My naive answer was to haunt me in the years to come. I heard diplomat after diplomat state the same sentiment. European diplomats happily left the local airport, champagne glasses in hand, after negotiating a diplomatic settlement. 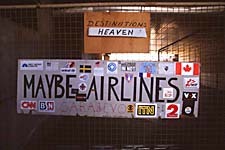 Moments after their plane left; the airport and city were bombed by the Yugoslav Air Force. Thus set in motion a pattern that would continue time and again. This was my welcome to the Balkans. With Slovenia now independent the movement turned to Croatia and Bosnia. Croatians valiantly struggled to set up local defense forces against the Yugoslav Army. Units were formed and camouflage camping uniforms were bought at local stores. 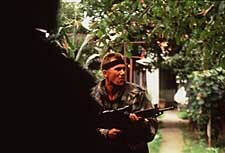 I worked with defense forces made up of local villagers. In the beginning it was a hunting rifle against machine guns and tanks. Serious warfare ensued. Planes began to attack small villages, and tanks lay siege to towns for months. The practice of ethnic cleansing was started. Each side was determined to purify the area. Refugees began to number in the thousands. In the beginning it was difficult to convince editors in New York that the war was serious. I thought Americans should be interested in the conflict. Yugoslavia was no longer just the place of the 1984 Olympics. Yugoslavia was a cancer in the heart of Europe. I would work for several weeks, take a break, and then return again. 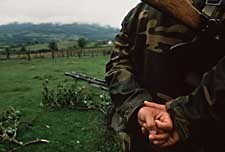 As the war progressed and spread into Bosnia, the level of violence increased. The stakes became higher for those involved. The world community half heartedly put its reputation on the line. It did more damage than good. It became difficult to justify my role as a journalist. 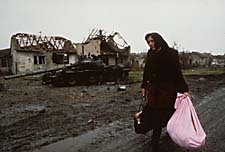 I had photographed the first ethnic cleansing of the Bosnian war. Innocent civilians executed by well-armed paramilitary forces. The pictures were published and there was no reaction from the politicians. I know that photographs cannot change the world by themselves. But I felt that the world community had truly failed. I saw how the first battle started with the townspeople fueled by nationalistic leaders. The war progressed from barber against butcher to commando unit against innocent civilian and finally evolved into tank against tank. I would travel and photograph the different sides. By spending time with the soldiers I wanted to show the world what it was like there. Then I would be able to explain the differences of these people. In the end I realized that they were the same people. manipulated for power and greed. In the beginning of the war all sides saw journalists as fair and impartial tellers of their story. As the war continued, the warring factions began to realize that their story would not be the only one told. The war had become quite dangerous. In the first six months over 30 journalists were killed. We went from being welcome to being targets. More often than not my day would include at least one arrest from varying sides determined to have you tell their story. It went even further once when I was accused of being a spy. I was interrogated and beaten for several days before my release. As the time passed defenses became stronger. For some it was barricades against sniper fire. For others, the defenses were of the mind. Life carried on in the towns and the cities. Whatever side you were on you had to eat and survive. It was the same for myself. In the beginning there were normal cars and little protection for the journalists. By the third year armored cars, flak jackets and helmets were the norm. However dangerous and difficult as it was, we could always leave. The people of the war torn regions of Yugoslavia could not. The people of Yugoslavia were Europeans. They were educated and had similar values to mine. They had CD players and VCRs. Their living room looked like mine. It didn't matter whether they were Serb, Croat or Muslim. For the most part the civilians of the war were trying to live day by day. I tried to photograph the forces that were taking over their lives. They quickly became engulfed in a whirlwind of civil war which no one could control. I felt a connection to this difficult and dangerous place. It wasn't a place I loved to be at. At times it was almost as if I was in W.W.II. Battles were fought in the same place as 40 years ago. The sad part was that the battles and the lines were also the same. No one had learned anything. History and the future were more important than the present. I had seen the war start and I wanted to see it end. Originally my work was intended as news photographs. The intent was to bring attention to the situation, to help people reach decisions in order to bring about change. Unfortunately change never really occurred. Today I hope the work stands as part of a document of the war. It is an accusation to those who saw yet stood by and did nothing until thousands had died and millions became refugees.